Win a $40 Gift Certificate to Howl at the Moon! Congratulations to Spencer Schmale on winning our twentieth High Five Giveaway and thank you to all who entered! 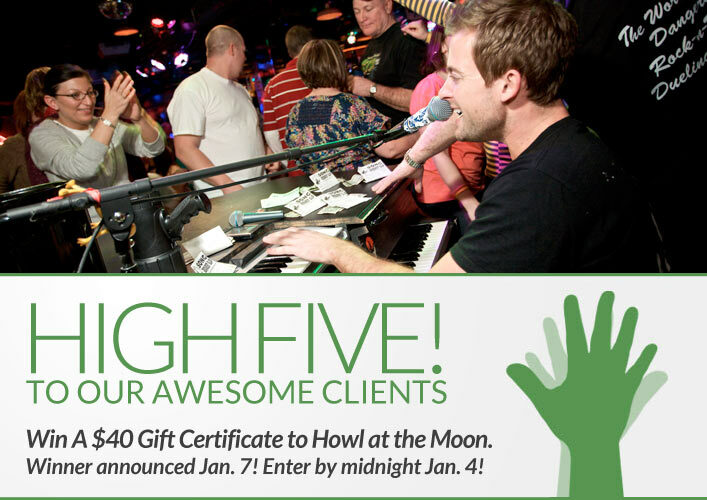 Our next High Five Giveaway is for a $40 gift certificate to Howl at the Moon. What is one of your new year’s resolutions for 2013? There is no wrong answer to this question. We just want to hear how you are hoping to help yourself or others have a great 2013! Now, just add a comment to this post with the right answer to be eligible to win! The winner will be announced on Monday, January 7. Entries must be received by midnight on Friday, January 4. Eat a garden or fruit salad every day in 2013! My resolution is to reduce stress and stop worrying so much. To try to be more compassionate toward myself and others. To do something cool that im looking forward to once a month. to open my own small successful business! To train for and run the Chicago Marathon in 2013!! Run more miles in 2013. Get myself more organized and get more volunteer work in..
To start earning passive income through a side business! Run a marathon with my wife! Cut the stress in my life ! eat better, play more, stress less! TO HAVE MORE FUN BECAUSE LIFE IS JUST TOO SHORT! !